One of the mistakes most website owners make is not paying enough attention to their landing pages. However, even if you’ve got a professional-looking, well-functioning WordPress site with great content and smart marketing funnels in place, you still won’t reach your sales goals if you don’t have an engaging landing page that converts. The lead capture page is where you want your visitors to land, be it after seeing an update on one of your social media channels, reading a piece of content you published on another platform but which links to your website, or finding one of your articles through organic search. How this page looks and feels can make or break a conversion. Nothing will really happen unless it’s convincing, has a clear call to action, uses the language of the user, focuses on benefits instead of features, and is easy to navigate and not confusing. These are the things you should focus on, and one of the powerful WordPress landing page plugins you’ll see below will make the process of building a page like that easier for you. All the high-converting landing pages you’ll find online have a few characteristics in common. For a start, there’s a headline that grabs attention and which shares what the page will be about. The copy underneath it, though, must answer the expectations the title creates. Most often, a slightly longer sub-title works great too. On the left, you’ll see a simple but powerful image. The headline is the first thing we notice, though, and then we go onto reading the paragraph they’ve included below it with more information on their services. Now, keep in mind that this text is tailored towards their target audience. Which means you too should know who your visitors are and what they need in order to make your offer sound tempting to them. 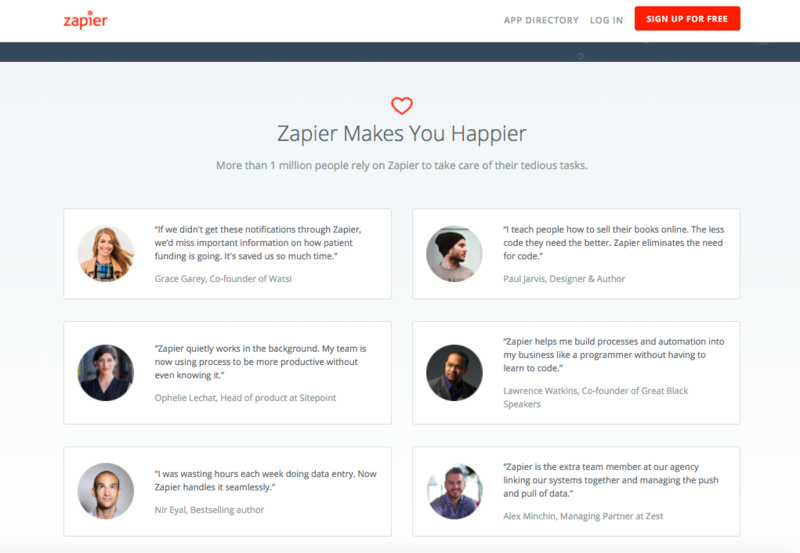 A great landing page also has one or more CTA buttons. When it comes to colors, each website will stay true to their original color scheme. A landing page should be more minimalist though, as the point is to encourage the visitor to click this one button. In the case of MailChimp, there’s 2 of them but both invite the visitor to sign up for their services and try their product. All the copy on the page is focused on the benefits of what’s offered. The rest of the landing page is about that too – mentioning features of the product, but describing the actual benefits the user will see once they sign up/buy/try for free/etc. Bullet points help when describing your unique value proposition in details later on the page. That allows people to consume the information in a more organized way and actually go through all the benefits, not just skim long paragraphs of text. Start outlining this most important page of your website. Even if you already have these but aren’t happy with the results, change direction. Plan what to remove so that it’s not cluttered and what new elements you can add. The landing page plugin you’ll install will help you see these changes live without the help of a web designer. WP Beaver Builder is one of the most popular WordPress page builder plugins and can be used for all pages. Over 500,000 site owners are enjoying its complete design system, great support, speed, and responsiveness. It allows you to build websites fast and make them look great in a matter of minutes. The elements and features it offers let you create a pro landing page effortlessly. It comes with WordPress templates for everyone’s needs and for each and every project, from selling an eBook to presenting a small business or a law firm. The other important pages on your website, such as Contact, About, Pricing, Newsletter and so on, are also something you can easily design with Beaver Builder. A plugin like that not only frees up your time but also unleashes your creativity. 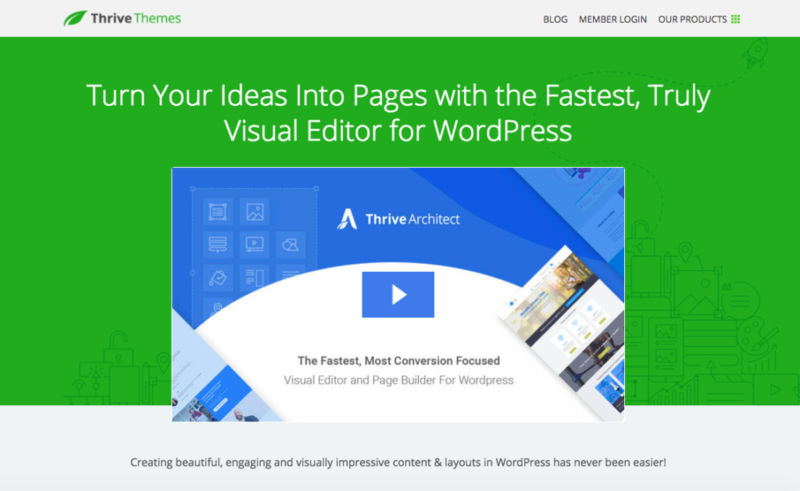 Thrive Architect by Thrive Themes is a drag & drop page builder that will help you create stunning and professional landing pages to turn visitors into leads. It’s fast, reliable and with fantastic features. Let’s explore some of them. With it’s so-called ‘click-to-edit’ technology, the builder allows you to edit and see the changes happen the moment you click that particular area of the page. It comes with the shocking number of 224 landing page templates that are sure to answer your needs as a website owner. Whatever your goals are, some of the designs already made for you will save you a ton of time and decisions to make. What’s more, Thrive Architect comes packed with pre-built conversion elements, which make some of the other plugins in your WordPress site useless. That means you can trust this one page builder plugin to do many things at once, and free up some space on your server by removing other plugins. With it, you can create not just an engaging sales page, but also a professional homepage, one promoting your webinar, a specific product, or leverage all the possible combinations of text and image that the features of Thrive Architect offer to publish blog posts that get attention. With the latest update of the plugin, there are even more advantages, such as modern and clean interface and more styling options all of which are with responsive design. 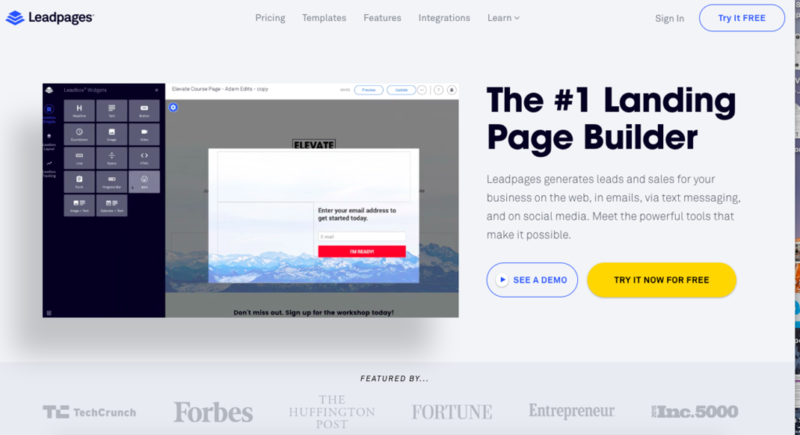 Leadpages is a set of powerful tools that can turn your website into a lead-generation machine. It’s popular for its lead generation software and great page builder. It comes along with more than 130 beautiful landing page templates. You can easily find the right one for you, regardless of which industry you’re in. They are all responsive, with drag & drop to customize every element on the page, and the ability to create as many landing pages as you’d like and view them all from a single dashboard. One of its disadvantages is the higher price, which of course is because of higher quality as well as the countless features it goes with. While you may not need all of them, they can ultimately turn your website into something more than you planned, and that can help you scale your business. The free trial they offer allows you to determine whether that’s the right choice for you. 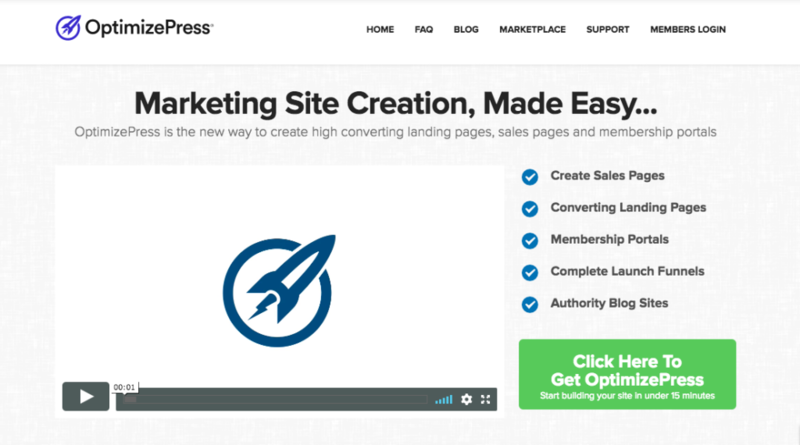 OptimizePress is another trusted landing page plugin, mostly used for high-converting landing pages, secure membership portals, training and course pages, complete launch funnels, and authority blogs. The pages you’ll build with OptimizePress in real-time are guaranteed to be mobile-friendly, compatible with any WP theme and easy to get done thanks to the pre-made templates and the functionality of 40 custom elements. The core package for those just starting out costs $97 and is a one-time payment. This one of the landing page plugins in our roundup can be found in the WordPress plugin directory. It allows for A/B testing to compare how different combinations of design elements perform, has a visual editor and works within the WordPress environment you’re familiar with, and immediately integrates with the theme you’re using. If you’re looking for a free option that’s as easy to use as possible, then WordPress Landing Pages might be the right choice for you. To do more with it, though, you’ll need to check out the free and paid add-ons, such as WordPress Calls to Action and WordPress Leads. Now you know why landing pages matter, what makes a great sales page, and can choose from 5 of the top WordPress landing page plugins available. You’ve got some decisions to make, each of which can be a turning point to converting visitors into customers. If you enjoyed this roundup, you may also want to see our post on the best blog themes for your WordPress site. Author and blogger in the fields of personal, spiritual and business growth. Lifestyle designer. Creator of Let's Reach Success.